Accent reduction - Raqs Without Borders 2019: MENA dance festival in NYC: 08/24/19-8/25/19. Registration is now open! We all speak English with different accents; however, sometimes it might be frustrating or embarassing for some people to hear from others that no one can understand what they are saying or often be criticized for speaking bad English with a thick foreign accent. Have you been told that you cannot get a job, or even book an acting gig or whatever is it that you would like to pursue because you speak English with a heavy foreign accent? Well, guess what, do not let that discourage you or make you feel bad. There is a solution for everything including a way to reduce or minimize your foreign accent with proper training and practice; therefore, make it less visible, make yourself more presentable when speaking to others, and finally be understood by others. We here at TORKOMADA, Inc. have designed private one-on-one accent reduction sessions for those who would like to enhance their American-English pronunciation, diction, articulation, speech and language skills; most importantly, improve one's accent, and sound more American. 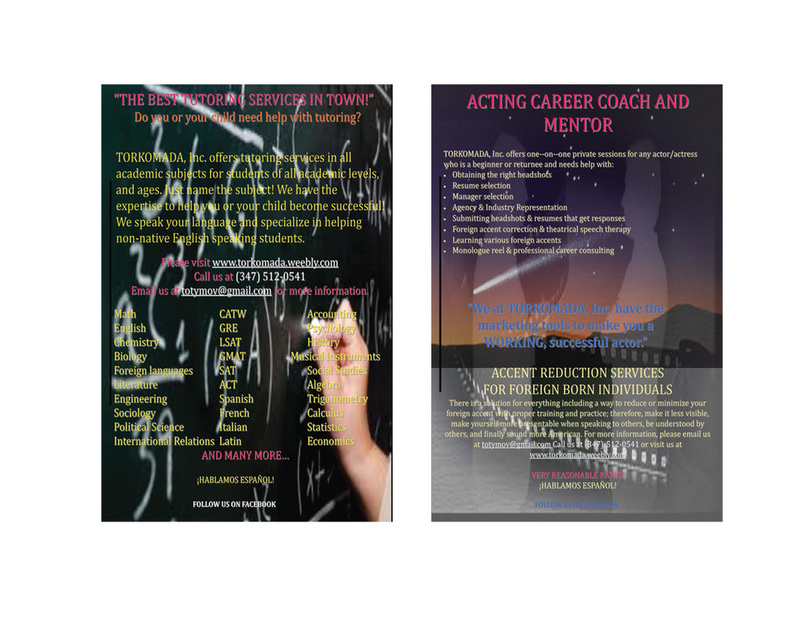 Whether you are a singer, actor, orator, public speaker, business owner, entrepreneur, lecturer, presenter, student, politician, attorney, leader, diplomat, health professional, teacher, journalist, consultant & advisor, or simply someone who would like to work on his or her accent, we help your speech skills bloom. If interested and would like to schedule a private session, please contact us for more information on class schedule, rates, availability, and location. If you prefer to meet for a session at a location which is convenient for you, please let us know and we would be happy to accommodate you for an extra charge. In addition, TORKOMADA, Inc. offers private on-line accent reduction classes on Skype; however, you must prepay for the session at least two days prior to the session using PayPal (click on the Buy Now button below to purchase a session). Note: PayPal charges an extra fee. Once the student has registered for the on-line class, there are no cancelations or refunds. NO EXCEPTIONS! LIKE US ON FACEBOOK AND GET A PACKAGE DEAL! 2014 TORKOMADA, Inc. All rights reserved.